One day in April is "The Day of the Child." I'm not exactly sure which day so I celebrate the whole of April as "The Month of the Child." Here's a good book for the child in all of us. 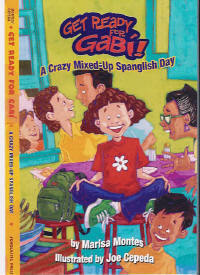 Third grader Gabi speaks Spanish at home and English at school and sometimes "Spanglish" everywhere. Don't we all? There are three more books in this adorable Spanglish Series. Read and enjoy them all. GET READY FOR GABI: Please Don't Go. ABOUT THE AUTHOR: Marisa Montes is a Puerto Rican army brat. She's also a writer, artist, lawyer, editor, humorist and activist among other things. To learn more about her and Gabi's series, visit her at http://www.marisamontes.com/. And as always, Read Latino.